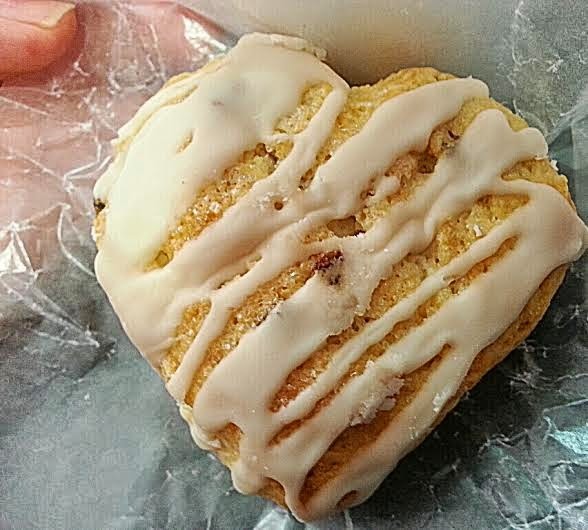 Since it is said that anyone's heart can turn to stone after so much beating and trauma or sadness; then it shouldn’t come as a surprise that another person with a strong affinity to scones turns hers into a heart of scone- lol... oh yeah, out of sheer love for the English breakfast biscuit (although it's good any time of day... or night. 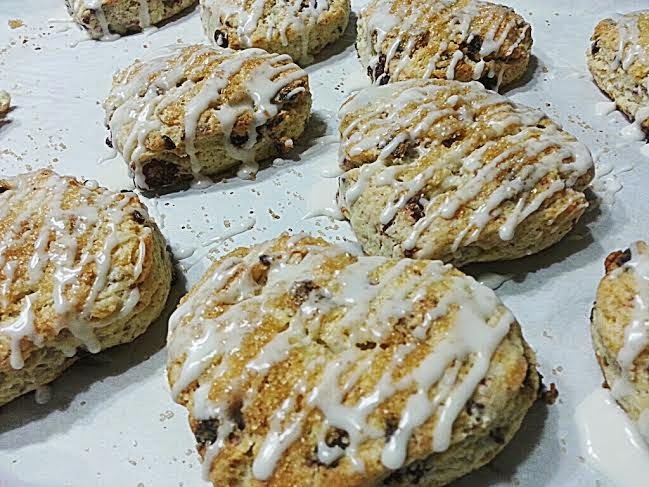 I'm talking about a friend/co-worker who happens to love my scones and that’s from her self-confession. 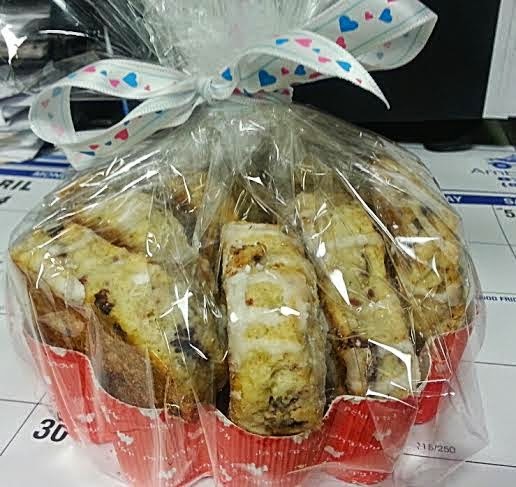 She also follows this blog so when she saw my blueberry scones post, she came to work the next day with a jar of clotted cream thinking I’d bring some to share like I normally do when I make or bake some treats. But it was one rare occasion when I didn’t bring any so we were all laughing when so told me about it. I was able to make it up to her anyway when I made it again and made sure she get her share of the wealth. I guess it’s safe to say that it started the scone connection. 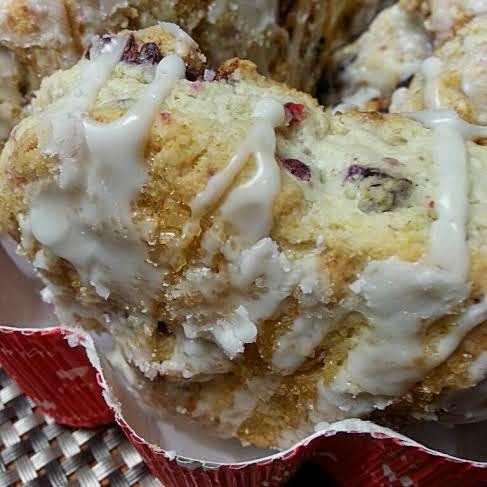 Scones and clotted cream with tea or coffee sounds so comforting! It's only natural that baking some immediately came to mind when I thought of what to give her to make her feel better after very trying times. I think my food can somehow warm a person's heart if not the gesture itself- of preparing something a person really likes. So start by sifting together 2 cups of all-purpose flour with 1 tablespoon baking powder, 3 tablespoons granulated white sugar and a pinch of salt. Add the grated frozen unsalted butter and just cut through the flour using a pastry cutter until it becomes crumbly with tiny bits of butter still visible. Lately I find it easier to use grated butter instead of cutting it into very small pieces. Freeze it first so it's really firm and easy to grate then return to the freezer until ready to use. Make a well at the center of the flour mix and pour the cream cheese mixture. I use a small rubber spatula to fold the mixtures together thus minimizing contact with my hands. They could get warm quicker than they should and I want to keep the tiny bits of butter. 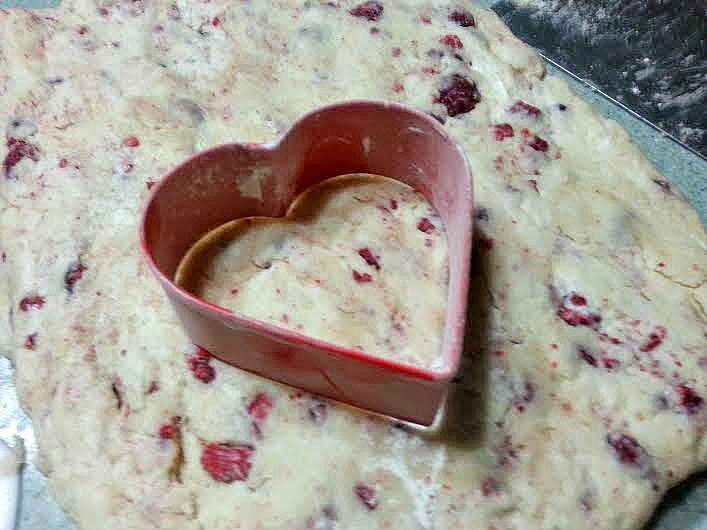 Add the raspberries (I used freeze dried despite having fresh ones because I don’t want the berries to bleed on the dough) fold like a letter and then flatten gently to about an inch using lightly floured hands. Sorry, no time to wash my hands here to take a shot. 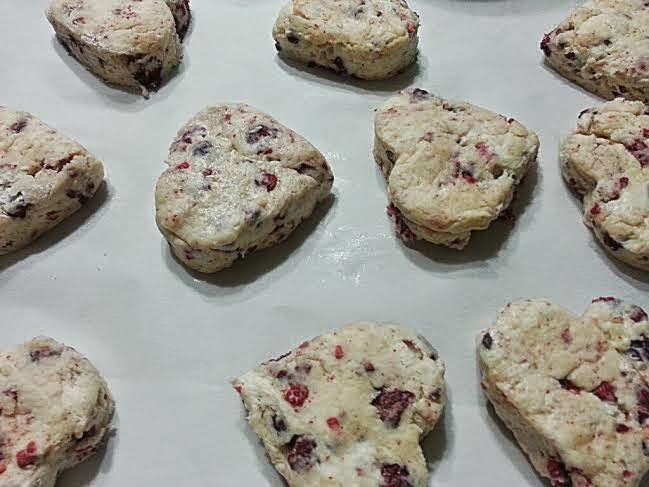 Using a floured heart-shaped cookie cutter, I cut the dough and placed them in a parchment-lined pan, an inch or so apart; brushed the tops with milk; sprinkled some Demerara sugar and bake at 400 degrees F for 15 minutes then lower the temp to 375 and bake for another 8-10 minutes. Transfer to a cooling rack. I used merely 3 tablespoons sugar for the dough so it needs glaze to complete the sweetness. To make the glaze, I used 3/4 cup powdered sugar, a tablespoon of milk and a teaspoon of pure vanilla extract. Whisk vigorously with a spoon until shiny and smooth. I'm so glad it was well received but I had to make another batch the next day to share with the rest of the team.